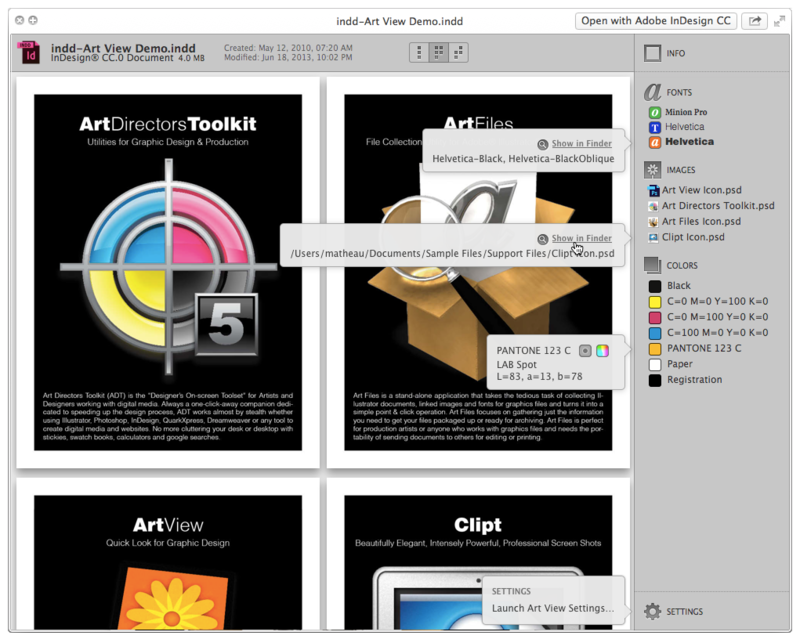 Art View is used to preview Creative Cloud and Creative Suite documents. Art View improves Quick Look icons, thumbnails and previews for Creative Cloud and Creative Suite users. Art View is a major time saver that allows graphic designers to preview, inspect, and reveal dependent font and image files from within Apple’s Quick Look preview feature. But the ability to preview is only the beginning. Illustrator and InDesign documents are not only pretty to look at, but they also show useful information like what images are linked within the document, what fonts have been used, what colors are defined and a whole lot more. And to make things even better, clicking fonts and linked images reveal their files in Finder. It’s miraculous what Quick Look can do with Art View. If you need more information please contact the developers of Art View (Code Line), or check out their product website.